Do you know what has been seriously lacking in my life since I had to go gluten-free? Light, fluffy biscuits. Yes. Light AND fluffy biscuits. They just…don’t seem to be possible either from a mix or from scratch. The closest I have ever come to what i seek was a light and fluffy dinner roll from Sinfully Gluten-Free in Dayton, Ohio. Those were awesome. But I don’t live in Dayton…and, technically, those aren’t really biscuits. However…the great purge of the gluten-free selection at my local grocery store was going on and one of the items that was on closeout just happened to be 1-2-3 Gluten Free Southern Glory Biscuits. The box lays it all out: Light & Fluffy. Completely gluten-free, wheat-free, dairy-free, casein-free, peanut-free, tree nut free, egg-free, and soy-free. Whew. On the Web site for the company, it might, just might even hint that these biscuits taste better than biscuits that contain gluten. So…I figured…why not? Since my roomie was craving biscuits and gravy and I had just whipped up a vegetarian mushroom gravy for the occasion…the biscuits were next. Now, the instructions on the back of the box are rather daunting. I will warn you about that. The easiest way to make these would be in a food processor…but mine is so tiny it wasn’t an option. So, for the first part of the process, I used my blender…then did the rest by hand. But…first things first. I am lactose intolerant…so the rest of the ingredients weren’t going to work for me. Sure, I could use heavy whipping cream and half and half…but my stomach may not like it after I eat a couple of these. 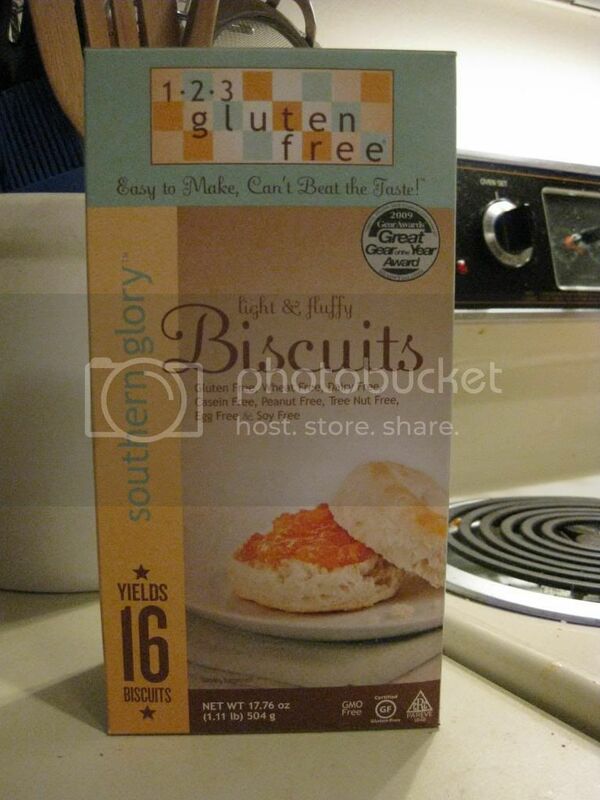 However, 1-2-3 Gluten Free has a suggestion on the bottom on how to make non-dairy buttermilk biscuits. So, I poured 1-1/3 cup of warm unsweetened almond milk and added 4 tablespoons of apple cider vinegar to it. I let it sit for about 25 minutes allowing it to thicken. Once it got there…the biscuits were on track to be made. Into my blender went the package of Southern Glory Biscuit Mix along with the butter, cut up into pieces. I pulsed it until it resembled a coarse meal, then added the ‘buttermilk’ to the mix. This is where my blender stopped being of use, so everything got poured into a bowl and I ended up kneading the dough until it came together into a ball. The next step was to roll out the dough to about a 1-1/2 inch thickness and cut the biscuits with a biscuit cutter or a glass. 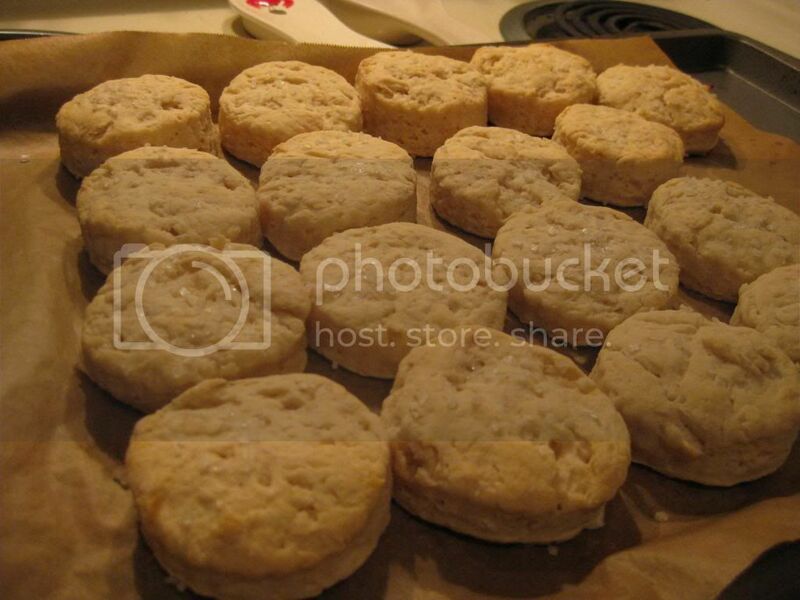 I used a biscuit cutter and ended up getting 18 biscuits from the dough. Then, into the refrigerator these went to cool. The box says that the colder the dough, the higher the biscuits would rise. Well, I wanted some really tall biscuits, so I left them to chill for about an hour (the box says to go for at least a half hour). Then, I preheated the oven to 375°F. Each biscuit got a light wash of almond milk and a sprinkling of salt before the pan went into the oven to bake for about 20 minutes. Mine actually took about 30 minutes because my heating element is STILL off. And when they came out of the oven…they really hadn’t risen all that much. Which…made me sad. My roommate and I decided to go ahead and split one to see how they tasted. They were still a little doughy in the middle, so I put the pan back in the oven for a little longer. But from the half we each were eating…we seemed to like it. It tasted like a real buttermilk biscuit. They weren’t exactly light…or fluffy…but they tasted good. So, that was at least half the battle. This morning, after a 10 mile run, I came home to assemble breakfast. These biscuits, topped with a homemade vegetarian mushroom gravy and one poached egg. My roommate requested biscuits and gravy…as she has been craving. And in this house, she eats what I cook and I cook what I can eat. So, sometimes allowing the gluten-free vegetarian to be the cook doesn’t always work out to her advantage. Lucky for her…I had a biscuit mix that needed to be used and some gravy that I could make thanks to some fresh produce from my CSA bin. So, I reheated the gravy, then popped the biscuits into the microwave to warm them back up. With breakfast assembled, I went to settle in to enjoy. And, sadly, the biscuit, while it tasted awesome, was still just heavy and dense. Not light and fluffy. It made me weep a little on the inside because all I really want is to be able to cook up an amazing biscuit to have every once in awhile. While the taste is spot-on with this mix from 1-2-3 Gluten Free…sadly the texture is still not right for me. Still too heavy. Still too dense. The promise of a light and fluffy biscuit might have fallen…flat…but the flavor…the taste…that is on point. It reminded me of the buttermilk biscuits from restaurants that I used to go to for breakfast. So…at least the taste hit a high-note for this gluten-free girl. This entry was posted in Bread, Breakfast, Entree, Food, Gluten-Free, Mix, Mushrooms, Products, Review, Sauce, Side Dish, Snacks, Vegan, Vegetarian by The Celiathlete. Bookmark the permalink.